All relationships face obstacles, but can romance really survive when there are prison bars between two people who love each other? What does it take to pledge your life to someone who may see out the rest of their life in prison? And what desperate measures would you take to be together at last? As well as some of Australia’s most notorious cases, Love Behind Bars also looks at some ordinary Australians in extraordinary circumstances – from the Australian girlfriend of an American death row murderer to the Sydney trust fund heiress who spent two years in a Honduran prison with her drug trafficking lover. This book also includes a chapter on famous murderers, and the women – and men – who fall for these killers. Victoria Heywood’s Love Behind Bars reflects a deep understanding of the human condition and the manner in which people deal with relationships when faced with extenuating circumstances. Respect, sincerity and empathy shine through as this accomplished author and meticulous researcher delves into true Australian stories and shares with us, the lives of people, particularly women who have experienced the highs and lows of finding (and often losing) love behind bars. It is not surprising that in researching the book, some of the stories gave Heywood nightmares and others made her cry. All made her think deeply about the cards that some people are dealt be they childhood experiences, drunken errors of judgment, peer pressure or the disease of addiction, all of which resulted in people being behind bars. She takes the reader on a journey in which love seeks to find a way (successfully more so for the incarcerated man than a woman). We hear firsthand the complexities of existence within prisons and the mind-numbing rules and regulations that must be overcome if love, in whatever form it is to take, will survive. She explores, through her subjects, the degree to which rationalisation, selective exclusion of irrefutable evidence and outright denial are often essential to feed love behind bars. The strength of Heywood’s research is that she has respectfully allowed her subjects to tell their own stories and in doing so captured the nuances of behaviour that give meaning to the bizarre, the barely believable and the extraordinary. This book will satisfy the curiosity of people who wonder about the reality of prison life and what happens when people are deprived of a life they have once known. There are women who naively believe that love alone will be the redemption of targeted loved ones regardless of the nature of their crimes. Although they know they can never meet, yet alone have a physical relationship, they do nonetheless find love behind bars. There are others who go to the ends of the earth to be with lovers (in one instance actually living in a prison) and others who belatedly and sadly realise that they have been used. Heywood presents a kaleidoscope of the dimensions of love as she maps the psychological, emotional and social impact of prison life on human relationships. 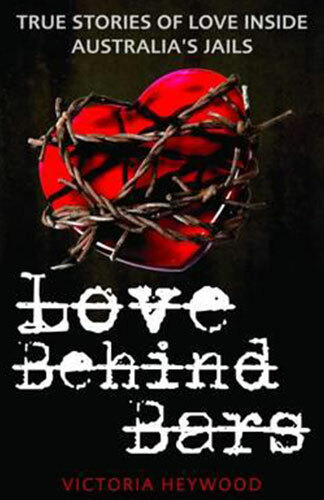 Love Behind Bars is an enlightening and truly readable book which would be incredibly valuable for people who work in spheres involving criminal and social justice. For me it was an informative and enjoyable book; it lifted the lid and filled many gaps borne of a curiosity spanning many years. It was the Shirley Collins murder of the fifties that first aroused my interest in the subject of true crime. It was the subject of many articles featured in the then Truth newspaper, banned in our home except when my dear departed grandmother, an avid reader of true crime visited. Even then I had to satisfy my curiosity by reading forbidden articles in the safety of the woodshed. Thanks to Victoria Heywood my curiosity has been satisfied without the need to hide in the woodshed.